The Wallers had just begun house-hunting in Waynesboro, located in Virginia's Shenandoah Valley, when Carrie found their future home — on Zillow. 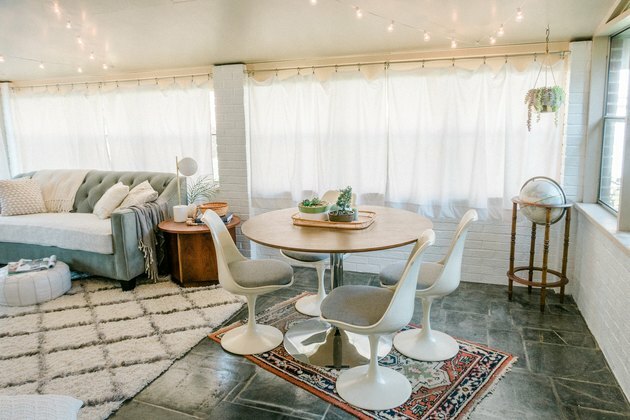 "I never thought we'd find a cute A-frame brick ranch in Virginia," she says. 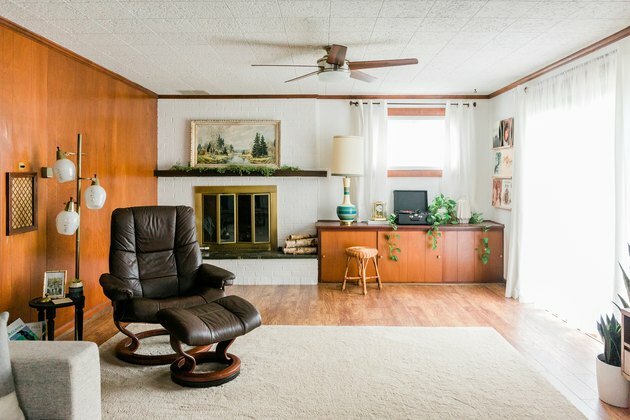 "I figured those types of unique, retro homes were only available in places like California or Vermont, so we put an offer in on the house the very same day we toured it." 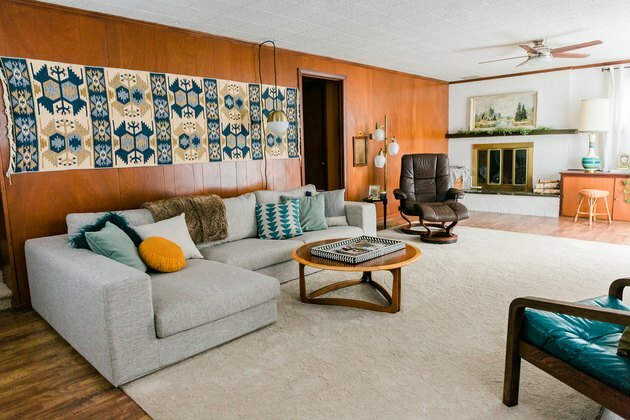 With blocks of similar midcentury homes, the neighborhood proved to be charmingly close-knit; it's a place where one can borrow a cup of sugar from next door. "While it might sound a little silly, I consider this house to be just another member of the family," says Waller. "I'd do anything to protect it." 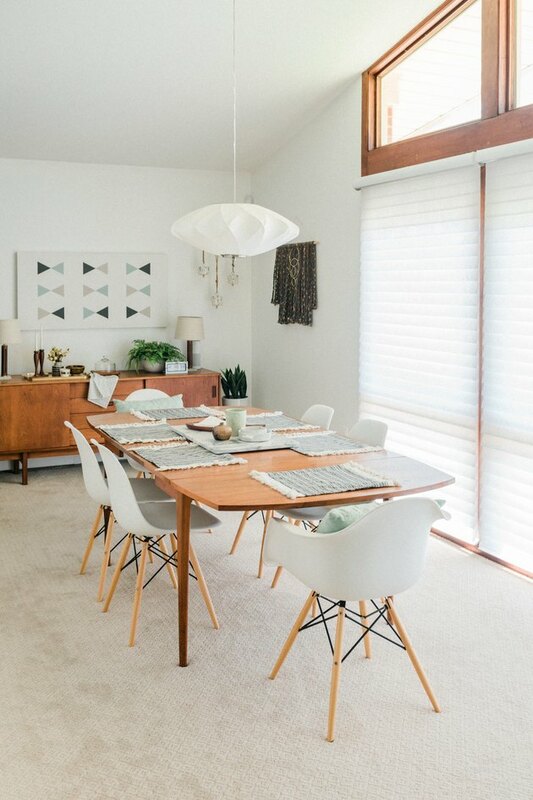 Since Waller and her husband are only the second people to own the home, the couple strove to maintain its original look and feel to reflect their passion for midcentury style while updating almost every surface: new carpet, new flooring, new paint, new counters, new tiles. Like most renovations, it was a balancing act. "The updated floors feel fresh without making the 1960s space look too modern," she says. "We always want to stay true to our home's retro roots." The rest is, however, decidedly DIY — which should come as no surprise. 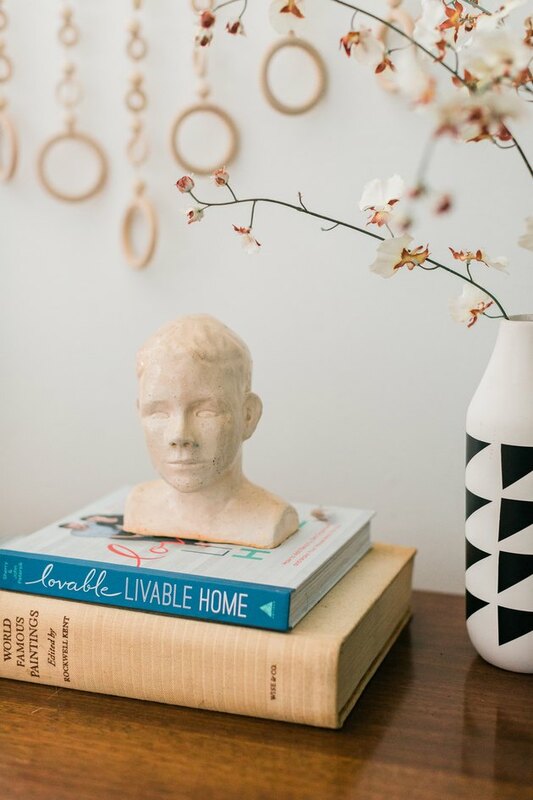 According to Waller, "My crafty side has helped us save a ton throughout the home decorating process. I live for that moment when I spot something on a high-end website and can think to myself, 'Hey! I could make that!'" Although the 3-bedroom, 2-bath house, with a bonus room, is still a work in progress, each update becomes, ironically, a return to form. 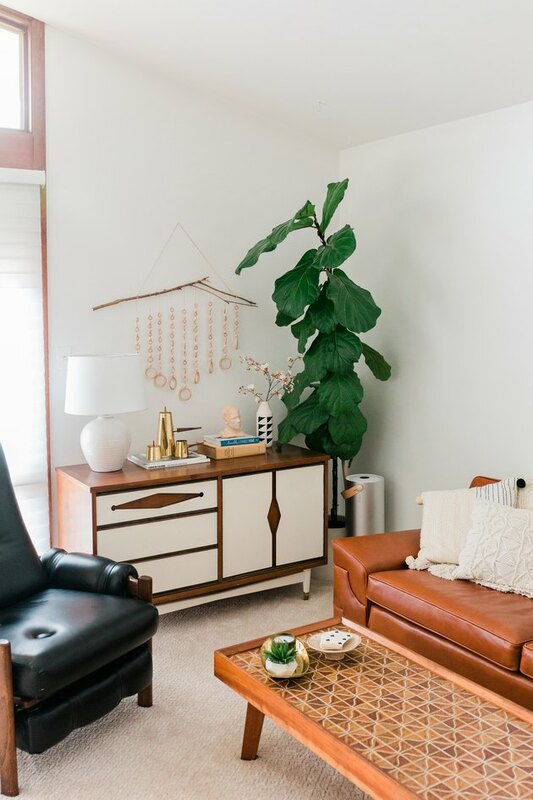 "I love to think of the previous homeowners coming back over and walking in to find their home looking like it was the day it was built in 1963," says Waller. 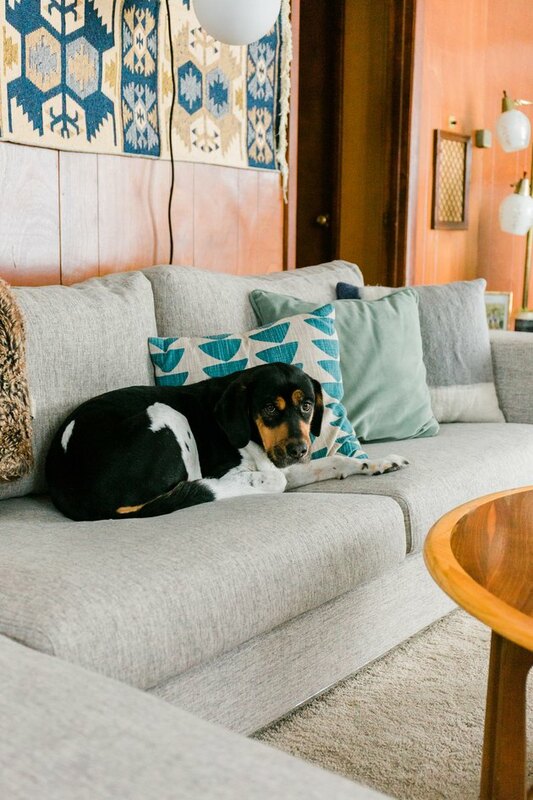 The Wallers live in the 1,958-square-foot single family home with a hound dog and three cats. 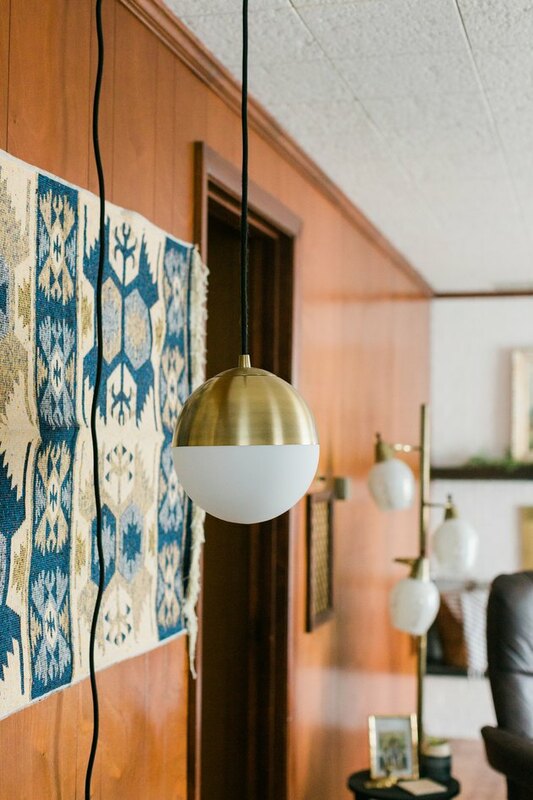 Globe pendants suit the midcentury decor. Waller's favorite detail of the house are the floor-to-ceiling windows. 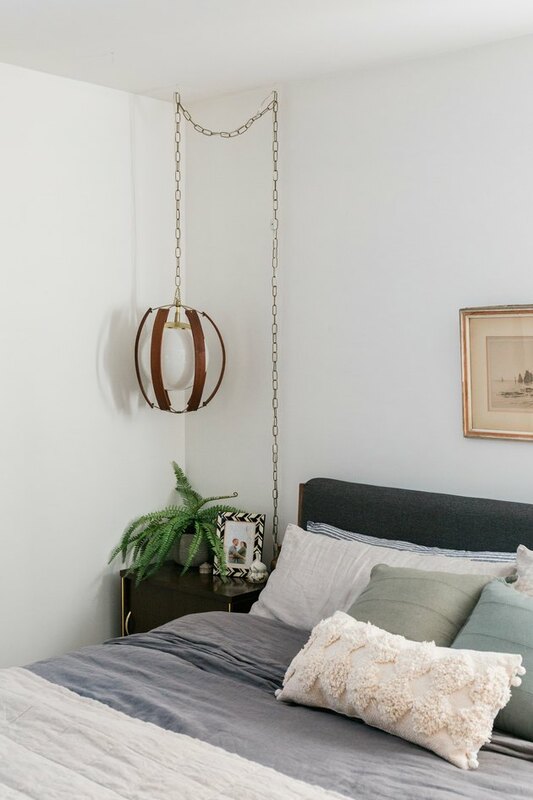 "It floods the entire interior front section of our home with natural sunlight, even on dreary raining days," she says. "The kitchen was top priority when it came to our spending budget," says Waller. 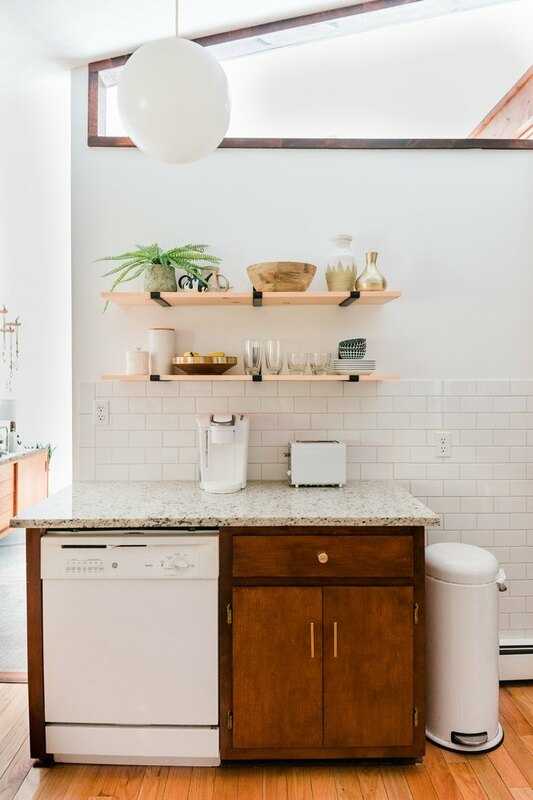 "Not even a year into living in the home, we had new granite counters put in, a white subway tile backsplash installed, and new cabinet hardware was put up throughout. We also took down the old wallpaper in this space, and paid professional painters to come give the room several coats of bright white paint." The dining area is also flooded with sunlight. "The collection of angular window frames and glass really makes it feel like one of those cool midcentury California homes I love drooling over in photos," says Waller. 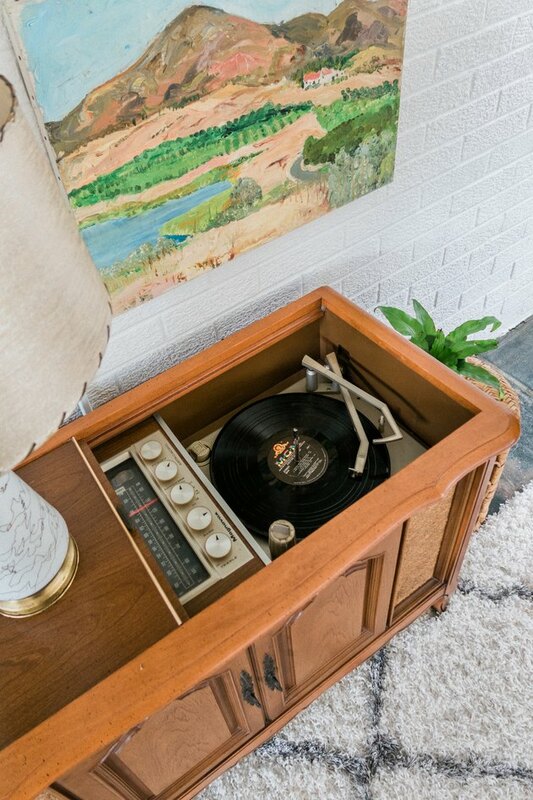 The living room is centered around a tile coffee table from Covesville Store Antiques, and a quirky horse print from Photos.com. 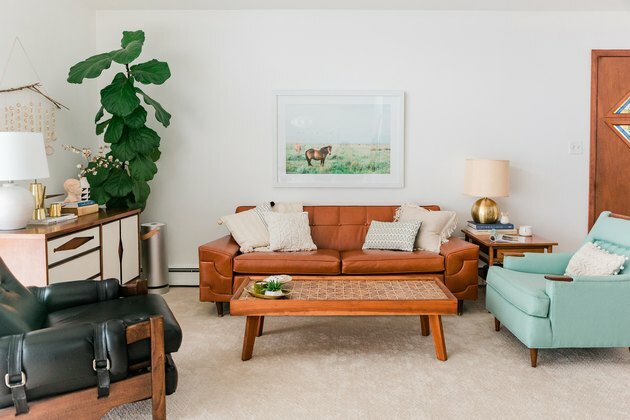 Waller reupholstered the sofa and chair in leather by Moore & Giles, a Virginia-based leather goods company that dates back to the 1930s. Waller made the wall hanging by hand. 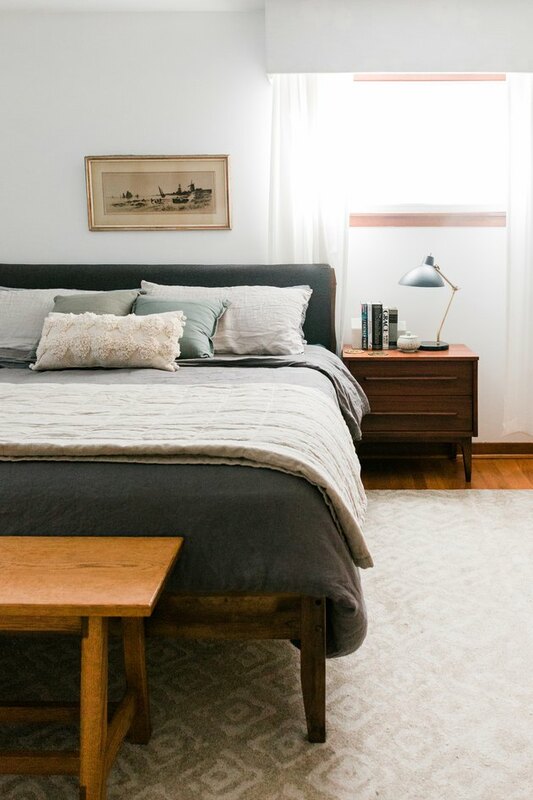 "I'm a DIYer by trade, so probably half of the decorative accents you see in our house were made by hand — things like upholstered window coverings, artwork, woven wall hangings, and even ceramic dishes," she says. It sits above a vintage bar cabinet from Queen City Marketplace, in Staunton, Virginia. One of the three bedrooms functions as an office. The vintage desk is also from Queen City Marketplace. In the master, midcentury details are subtle. The linens are all by Cultiver. The vintage lamp is from the Staunton Antique Center. Waller added the wood paneling in the bedroom herself. 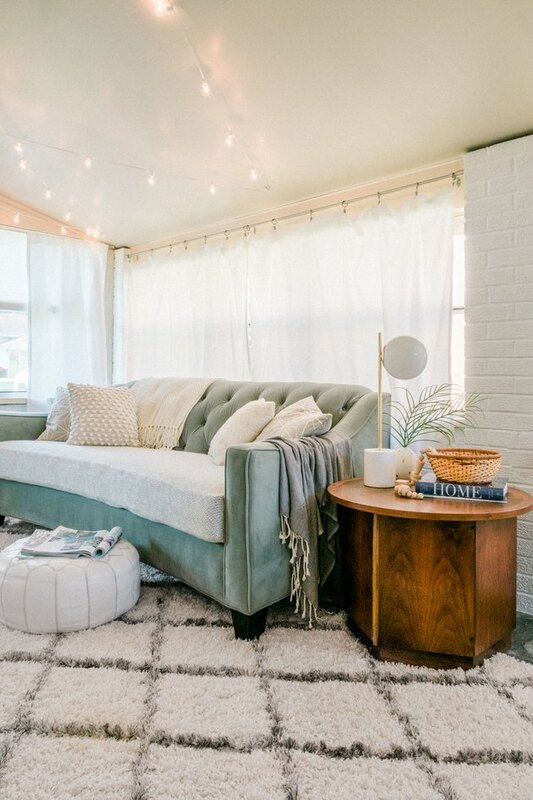 The sunroom has a more bohemian vibe. There's also a small dining area with a vintage Oriental rug. 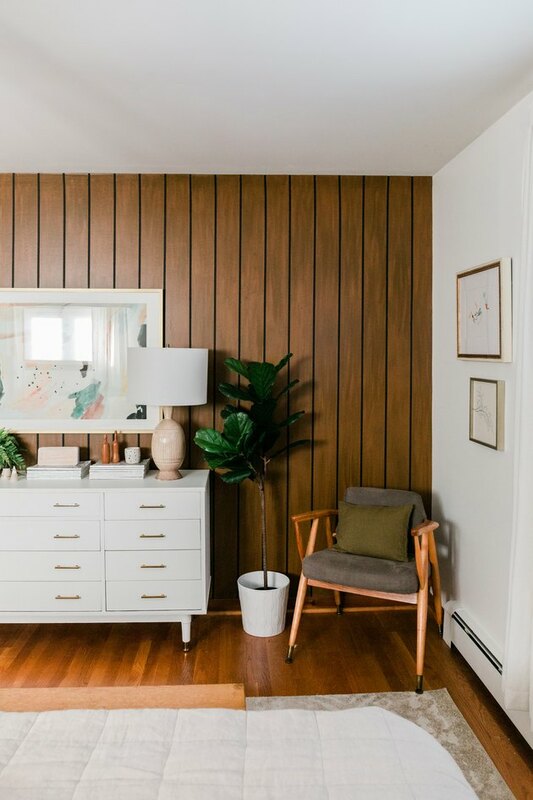 "Our main goal throughout the decorating process has been to not stray far from the midcentury era our home was built in," says Waller. 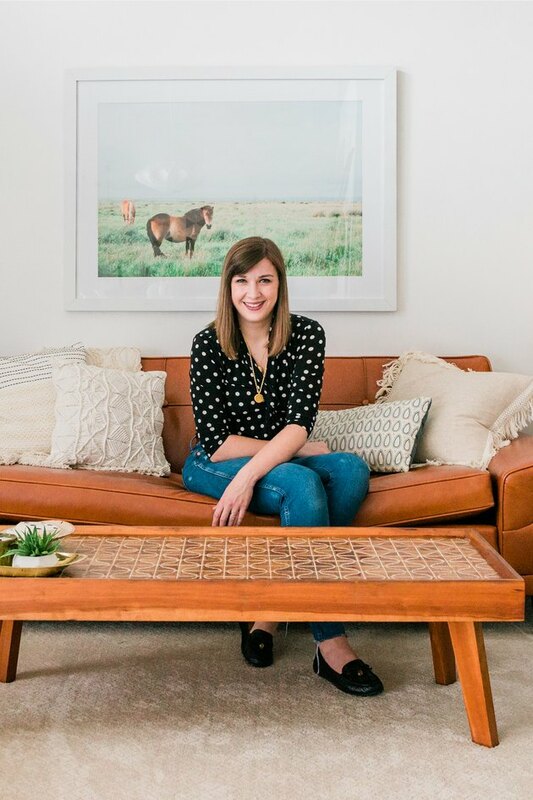 "Every time we think about renovating a room, we go back and look at images of homes the way they were in the 1960s so we can be inspired by that specific era of design."